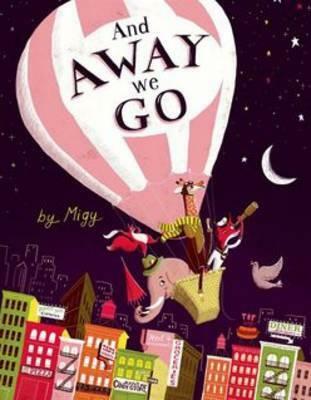 Kids' Book Review: Review: And Away We Go! Review: And Away We Go! Fox has received a special delivery. A hot air balloon! He plans to make a trip to the moon and his friend Elephant is keen to go along. 'Hop in!' says Fox, but before they leave, the grab some pizza for the long journey ahead. Just as they're about to go, Giraffe begs to come along. 'Hop in!' says Fox, but before they leave, they really do need to pick up some milkshakes. Just as they're about to go, Squirrel and his band ask if they can go, too. 'Hop in!' says Fox. They could use some music for the trip. And so it goes on--with many an animal friend cramming the balloon, and bringing along something fabulous for the journey. Of course, a balloon can only hold so much. This is a very familiar storyline made good with a series of gorgeous illustrations and plenty of action. Everyone loves a good adventure ... add animal friends and plenty of kook, and you have the perfect book to read out loud to kids in a group setting, as well as snuggled up on the couch. Lots of fun, and a fine addition for illustration lovers. Title: And Away We Go!